Farah Wardani (b. Jakarta, 1975), completed her MA in Art History (20th Century) from the Department of Historical & Cultural Studies, Goldsmiths College, London, UK, in 2001. She has been active as a teacher, writer, curator and art organizer since 2001 in her home country, Indonesia. In 2007 she co-authored Indonesian Women Artists: The Curtain Opens with Carla Bianpoen and Wulan Dirgantoro. Her curatorial works encompass projects collaborating with art spaces like Cemeti Art House, ruangrupa, Edwin’s Gallery, Nadi Gallery, Valentine Willie Fine Arts, KL and working as a consulting curator for the exhibition Indonesian Eye: Fantasies & Realities at Saatchi Gallery, London, 2011. She was also involved in the Yogyakarta Biennale 2013 as the artistic director. Since 2007 she has served as the executive director of Indonesian Visual Art Archive (IVAA) in Yogyakarta, Indonesia, with works include the IVAA Digital Archive ( http://archive.ivaa-online.org/ ), the first digital archive of contemporary art in the country. 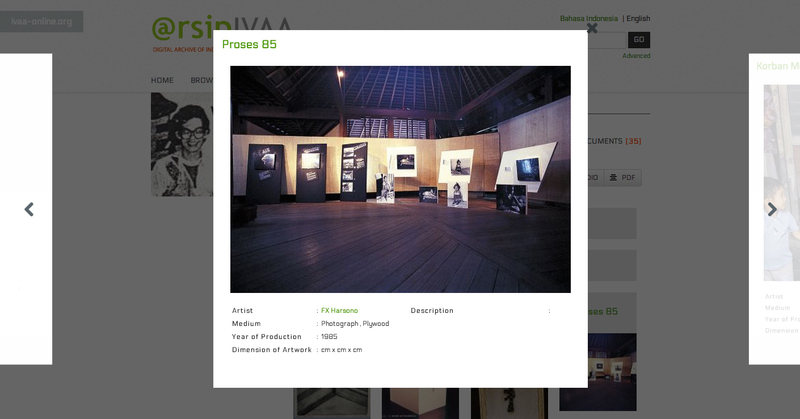 In 2013 IVAA initiated a partnership with The National Gallery of Indonesia (GNI) to create the GNI online archive system, as well as digitizing GNI archives, which will be completed end of 2014.